There was some optimism last week when House Republicans, after failing to advance the Senate’s immigration reform bill, endorsed a set of principles for an immigration reform bill. The principles were nebulous and open to multiple interpretations, but the effort itself made some people hopeful that a immigration reform might have some chance of becoming law. Alas, Mitch McConnell threw cold water over those hopes on Tuesday, announcing that the Senate won’t move any immigration reform that adheres to the House GOP’s principles. 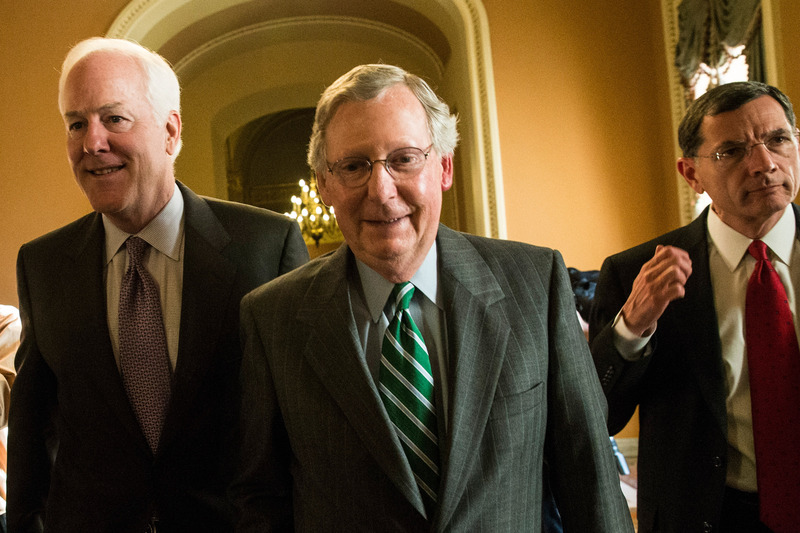 House Republicans have made it clear that they won’t advance a single immigration reform bill. Rather, they intend to split it up into multiple pieces of legislation, with each one addressing a different aspect of reform. You might have one bill focused on border security, one focused on the legal status of immigrant children, and so on. That way, more conservative members can vote for the border security part without voting for the amnesty part. When McConnell says “the Senate insists on comprehensive,” he’s rejecting that approach. He wants the Senate to pass one immigration bill and one immigration bill only, and since the House insists on a piecemeal approach, McConnell says, reform has no chance of passing both houses and becoming law. If there’s one thing that could blow up GOP chances for a good 2014, it would be an explosive debate over immigration in the House. The only sure way to avoid such a debate is not to let anything onto the floor in the first place. McConnell doesn’t want the House to even debate an immigration bill, let alone pass one, because that would destroy party unity and imperil the GOP’s chances of winning back the Senate. And that, in turn, would imperil McConnell’s own chances of becoming Senate Majority Leader next year. By characterizing immigration reform as dead on arrival, McConnell protects Senate Republicans from having to take any tough votes on immigration, and also saves House Republicans from having an ugly public battle over the policy. The only loser in his scheme is the rest of America.